With the world in general, and Thailand in particular, seemingly serving wenches at the tables of China, the title of this book caught my eye. 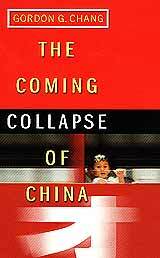 The Coming Collapse of China (Arrow Books 2002, ISBN 0-09-944534-4) apparently goes counter to the notion that China is on the brink of taking over as the world’s next super power. Instead of the expected explosion, author Gordon Chang (at least his surname sounds right) predicts an implosion of the economy and government. The book is divided into snappy headed chapters, such as [email protected] china .communism or the Banks that Sank. In fact this kind of ‘hip’ journalistic style runs all the way through the book. Far from being a weighty tome, Gordon Chang has produced something eminently readable, for the non-economist. According to the author, one should read the published Chinese statistics very closely. The 3 percent unemployment figures are probably six times that amount, says Chang, and the ‘profit’ from the State Owned Enterprises does not reveal the financial propping up being done by the central government. Once this figure is removed, the true numbers show horrifying deficits. Chang also claims that the Party is not averse to cooking the stock exchange books as well. The influence of government is everywhere. Cronyism is another facet of the Chinese way of doing business, with the all-important photographs being taken with ‘important people’ to show which important contacts you have too. This is, however, endemic in Asia, and not restricted to China. A quick scan of any business office in Thailand will soon show who is trying to nestle up with whom! However, author Chang does show just how far ‘The Party’ will go to protect its own and itself, but then shows just how the transparency of the internet will eventually allow the truth to come out. When that happens, says Chang, China will crumble and the Party will fall. With the newspapers every day detailing yet another joint venture in the Chinese auto field, and yet on the other hand, detailing more restrictions on Hong Kong, for example, it is difficult to extract just what is the ‘real’ picture. Gordon Chang’s book can certainly fill in some background details for the dedicated China watcher. I found the epilogue somewhat chilling, to read of a massive explosion in a Chinese city, with one lone deaf man apprehended, when the blasts were obviously the work of a team of professionals. Chang wrote, "Local Party cadres could not admit the truth but had to find someone to blame. As they invented their stories, they also had to censor news and cordon off communities from the rest of the world." Had a sort of familiar ring to it, I thought! It is not quite an ‘Apocalypse Now’ sort of book, rather it is an ‘Apocalypse Tomorrow’! "In China the government will fall when fear becomes rage," writes Chang, and he believes that will be soon. A disturbing book that all those who would go to bed with the Chinese mistress should read carefully before snuggling up tight! At B. 450 a cheap night between the covers. Out of the ashes of Annsorn (Pop) Joralie’s old band ‘Satin Soul’ came the brand-new and improved ‘Pop’s Pattaya All Stars’; aptly named as they really are the stars of Pattaya’s rock music scene. They are Somjet (A) Sol’gsree on lead vocals. A, over the last twelve months, has gotten stronger not only in his vocal ability, but also in his stage presence. e roams the front stage at the band’s live concerts, using his natural good looks to wow all the ladies in the crowd. On keyboards we have Tumnid (Nok) Parkpitcharoen, the professor of the band. Nok is a classical seventies type keyboard player in the realms of Jon Lord of Deep Purple and Ken Hensley of Uriah Heep. He plays with great dexterity, gives out a wall of sound to keep the band’s groove going, all the while not afraid to give his keyboard rack a good thumpin’. During his solos he makes sure there is plenty of good old seventies gurning from the wizard of the keyboards, too. Bangin’ the bins at the back of the stage is the definite character of the band, Munsood (Sood) Slam, great name for a drummer. Sood is not only a great drummer, but also one of the most cheerful people you are ever likely to meet. Sood is the only man alive who can do a great impression of David Lee Roth, while playing the drums as he does here on this recording, where he takes over lead vocals for the band’s rendition of ‘Jump’. This usually results in an outbreak of stage diving led by Lisa Lurve. On bass guitar - and latest addition to the band - is the dreadlocked rockin’ dervish Winai (Marn) Pattana, who has brought a whole new energy to the band since his arrival. Marn’s bass nails each song down in very similar style to the way the great John Entwistle always did with the Who, except that Marn is just a blur of dreadlocked activity on stage, giving the band a great visual asset. Then, of course, center stage is the main man himself Annsorn (Pop) Joralie. Every time Pop goes into his first solo of the set there is a tremendous thud as the jaws of the newcomers to the band hit the ground. Such is Pop’s mastery of an electric guitar it is hard to imagine what he cannot do with it. Pop’s soloing is legendary, playing in a variety of styles. Sometimes he plays with great gentleness just the right notes to fill out a song, just as in his wonderful solo during Free’s ‘All Right Now’; at other times it is "if you got it flaunt it" and Pop wrenches a hundred notes a second from his axe to a devastating effect while shredding Jimi Hendrix’ ‘Purple Haze’. Pop also has more stage presence than most of the big international name guitar slingers. To add even more excitement to the evening, Pop called on a couple of very special guest stars to join the band on stage. First we were treated to the delights of Shenanigans director of music Rick Bryant’s lovely wife Harpic. Her duet with A on a crunching version of AC/DC’s ‘You Shook me All Night Long’ nearly brought the walls of Shenanigans tumbling down. After Pop had guitar talked his way through a rollicking version of Bon Jovi’s ‘Livin’ On A Prayer’, this set of live songs was brought to a romantic conclusion with Phill Dunn making his recording debut with a stirring version of Ronan Keating’s ‘When You Say Nothing At All’. That very nicely raped things up. For an example of high quality live rock ‘n’ roll, this recording takes some beating, an album that will stay on Ella Crew’s turntable for many a year. As an added bonus the artwork for the album is simply stunning. It is the result of the combined artistry of Ron Keeley and Jason Payne with more than a little help from the photos of Wayne Ogonoski and Pattaya Mail’s very own Brendan Richards. If you were at Shenanigans on the night of 21st May 2004 when this great concert recording took place, look on the inside cover. You might well pick out your name or even your photograph. 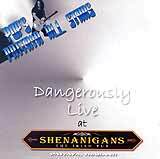 Pop’s Pattaya All Stars will be holding a launch party for ‘Dangerously Live’ at Shenanigans on Friday July 2, band on stage at midnight after the Bastards with their act starting at 10 pm. A night not to be missed. The CDs are very reasonably priced at 300 baht each, or if you want to buy the set and get the Bastards live album ‘Live and Dangerous’, too, the 2 CD’s are 500 baht.